As an alternative to the Trailroc 245 I have been using the last couple of months, I have also been running in Inov8’s Race Ultra 270 trail shoe. As the name suggests, these are shoes aimed squarely at the ever-growing ultra-distance market and are made for runners wishing to take on serious distances. The shoes come with a 4mm drop from heel to toe, and with a weight of 270g for a UK size 8 (as with all of Inov8’s shoes, the number denomination in the name refers to the weight of the shoe) they aren’t exactly light-weight, but still come in below the “heavy” classification. 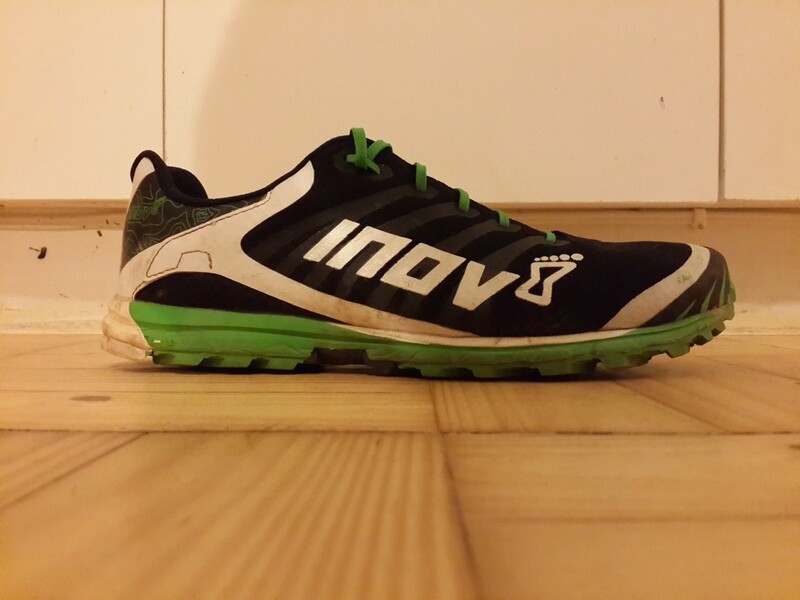 The shoes are definitely more traditional looking than some other offerings in Inov8’s stable. My test pair was black and green with white accents (the alternative being a slightly more in-your-face blend of bright yellow and light blue). The shoes have a nicely low-slung silhouette, and look every bit the racing shoes they are. As with most of Inov8’s shoes, the Race Ultras 270s have a nice and roomy toe box. This makes a lot of sense, as your feet will start swelling slightly on longer runs and this gives you a little extra breathing space. As Inov8s stated mission is to be about natural running, the wide toe box allows your toes to move and splay laterally and will help avoid those dreaded “runner’s toes”. The upper stretches around the foot nicely while still being nice and pliable due to the light mesh used in construction. As with the Trailroc 245s I reviewed the sole of the Race Ultra 270s is constructed using Inov8’s Tri-C compound (basically meaning softer rubber is used on areas needing more grip and harder rubber where you need more durability). The sole also encompasses their upgraded meta-shank (their name for a rock plate) which doesn’t just consist of a single part, but rather a 5-fingered plate that aligns with the individual metatarsals, therefore giving a slightly looser ride than a single rigid plate does. That being said, the Race Ultras are definitely a much stiffer shoe than the Trailrocs, but this is once again due to the “horses for courses” factor whereby these are made with the idea of offering slightly more support towards the end of a 10 hour run when you need the extra help. There is also a specially designed connection point for Inov8’s Race Ultra gaiter, should these be needed for sandy/very muddy conditions. As one would expect from a shoe with a relatively low (4mm from heel to toe) drop, the shoes really connect you to the trail surface well. 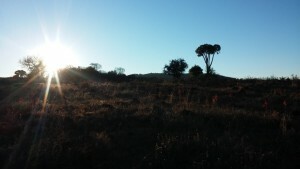 They allow you to run technical sections fairly aggressively should you want to, but are still capable of doing long distances with enough support to keep you going. The best way to describe general feel around the foot is by calling it “stable, yet not quite firm”, which is where I feel the shoe rises above the competition. With many of the ultra-specific shoes out there, one tends to lose connectivity and feel due to the additional cushioning needed. This was also the case with the 270’s forerunner, the Race Ultra 290, which has a similar construction but with a higher stack height and drop of 8mm. The 270 is definitely a “racer”, and even though they will cover extreme distances well, they still have enough feel so you can really give it all on technical sections without losing traction. As mentioned, the Ultra 270s have a rock plate for underfoot protection. They are also slightly more built up around the sides of the soles than what I’ve come to expect of “natural” shoes, but still nowhere near what a traditional shoe looks like. The front area is raised a bit and does have some added rubber to protect the toes (something that was lacking in the Trailrocs), but most of this is kept to the minimum to avoid adding too much unnecessary weight – at the end of the day this is still a minimalist shoe. A low heel cap is also a nice addition, as this adds some support at the back, while still not getting in the way or causing any chafing around the ankle (as can sometimes happen). These shoes are made for covering long distance, and so far they have done themselves proud. 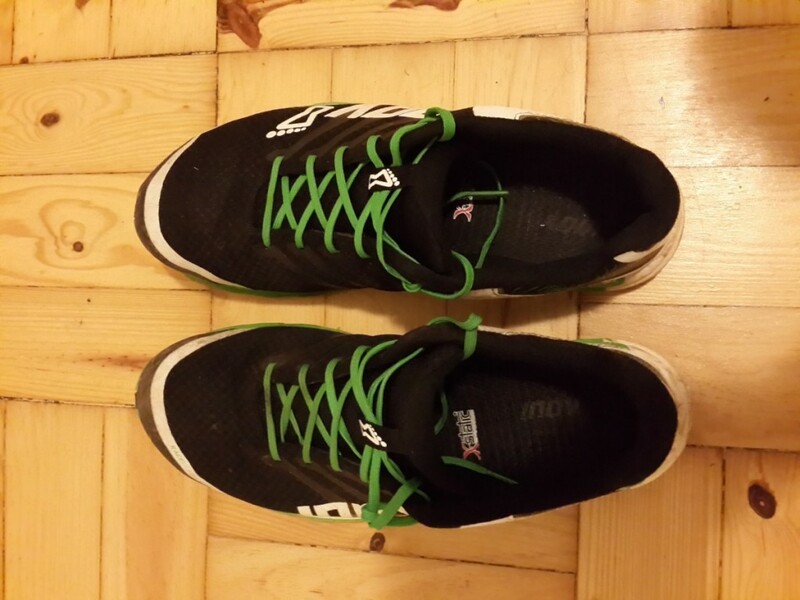 I have clocked more than 200km in mine and there is absolutely no sign of anything-but-normal wear on the soles. 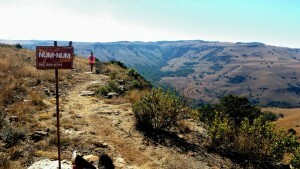 When one keeps in mind that most ultra-distance races (think Western States, Cape Town Ultra Trail etc.) 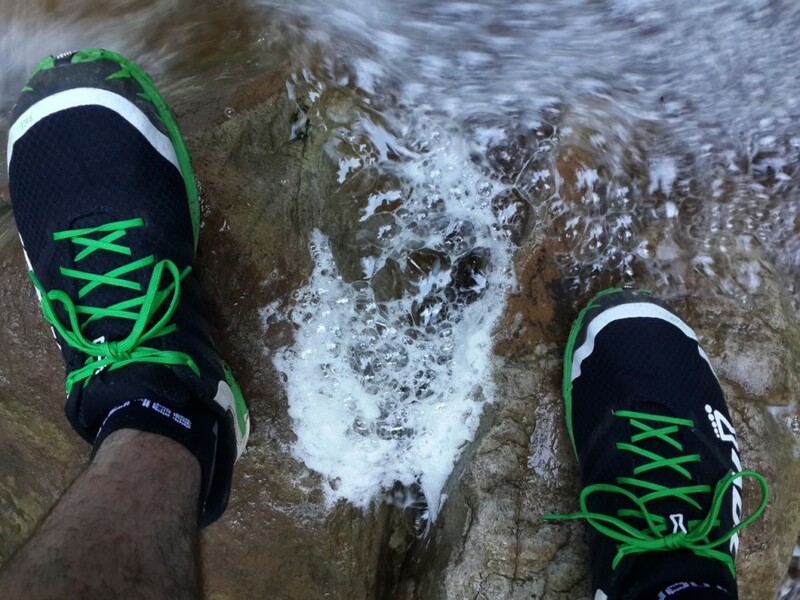 are run on a combination of both road and trail, it makes sense to have a shoe that can handle both well. As such, the tread pattern on the Race Ultras are a little different to that found on Inov8’s pure trail shoes in order to cater for the possibility of spending prolonged sections on the road. The Race Ultra is still predominantly a trail shoe (and running on road surfaces only will probably kill it a lot sooner) but it can definitely hold its own on the harder surfaces without falling to pieces and taking too much damage. I can definitely recommend these for anybody wanting a shoe that can handle serious miles without having to give away too much in terms of feel. To put it into practical terms – my thinking at the moment is that I use my Trailroc 245s for most runs, but as soon as I know I will be spending upwards of 3 hours on the trail, the 270s are my go-to option (regardless of terrain). With the Race Ultra 270 I really think that Inov8 have come up with a shoe close to something like the Salomon S-Lab Sense Ultra range (with the Inov8s coming in at about three quarters of the price and with possibly double the mileage in them), where you don’t necessarily have to give up speed/feel when choosing a shoe for long distance running. As far as downsides go – the firmness of the shoe might be an issue to people used to a loose, very bendable shoe. That being said though, I have noticed that the shoes have loosened up considerably after some miles when compared to the feel straight out of the box. Also as far as shoes in this class are concerned, most will be way stiffer and less forgiving (the support vs. feel factor – more support equals more cushioning equals less feel) and I would therefore almost call this a non-issue. I have noticed some online reviews complain that the double mesh (as opposed to Inov8’s other shoes which are normally a single layer) upper doesn’t breathe quite as well as would be expected, but have not had any issues with this myself, although this might be down to the fact that I run in very light socks. All in all, I found this to be a fantastic shoe for longer runs. I would recommend it to anybody keen to move into longer distances who still want to be able to race when need be and who don’t like some of the bulky offerings out there. I myself will be putting these to use for both the Table Mountain Challenge and Cape Town Ultra Trail this year and am looking forward to spending many more hours in the company of these bad boys!